This is super nifty. 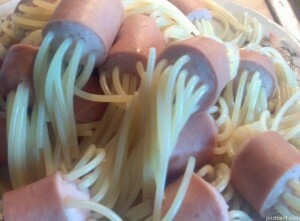 Apparently you insert dry spaghetti into cut up hot dogs, then boil them, and it turns out like the picture on the right. You could also use different coloured spaghetti, and combinations of types, for all kinds of freaky creations. I can see why kids would find this awesome. Because it is! Tagged food, FSM, General, spaghetti, weird, WIN.